Saw this a while ago, and just thought it was a “One Off”. Then on a visit to a client yesterday I saw it on both machines I was working on. 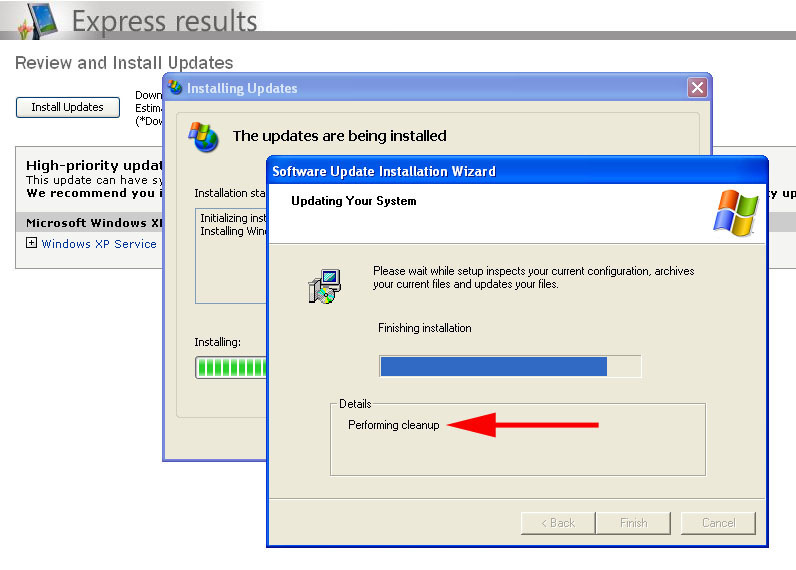 This might scare you, but you need to kill the update, don’t panic at this stage SP3 is already on. Update 05/04/11: Before continuing please read the feedback below. Ive never personally seen any adverse effects from doing this and I’ve rolled out a few thousand service packs. 1. 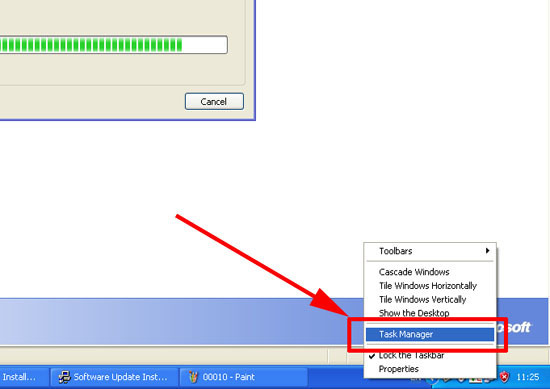 Right click your task bar and select “Task Manager”. 2. 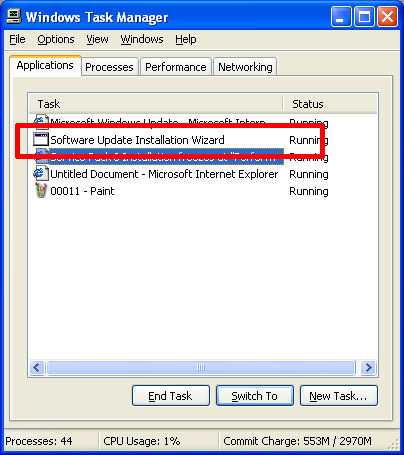 On the applications tab > Select the Software Update Installation Wizard > Click End Task > Accept any warnings etc. 3. Reboot the PC > SP3 installation will recover and finish, ignore any errors or warnings just let it boot up and you will be at SP3, at this point finish the good work by going to windows update and getting all the post SP3 updates. 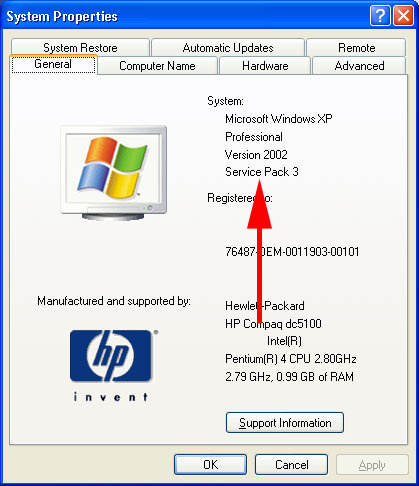 I am sending you a message concerning your advice on the Windows XP SP3 install “hanging” at “Performing Cleanup…”. The advice you give is to end the installation task at this point and reboot the computer. The truth of the matter is that during the “Performing Cleanup…” step, there is indeed quite a bit of activity and updating going on. I’ve had this step take as long as 6 hours on slower machines on our network but it finishes successfully. For testing purposes, I tried your solution on three training machines that were still running SP2 and ran into numerous issues after rebooting with getting several programs to install that require a minimum of SP3–Adobe Standard/Professional 10 is only one example and will refuse to install on all three of the test machines that I tried your suggested fix on. It appears that even though Windows shows in system properties to be upgraded to SP3, it is not completely finished if you stopped the install prematurely by ending that task. I strongly advise to consider changing your solution to simply wait out the “Performing Cleanup…” task until it finishes. It can take a while. 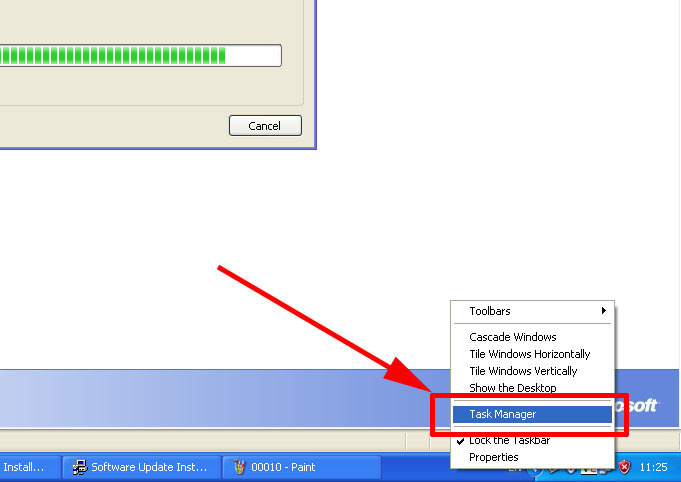 I’ve found one way to help the process along is to set the process for the updater to “high priority” in task manager. This resulted in drastically faster install times when the installer seemed to “hang” at that part of the install.